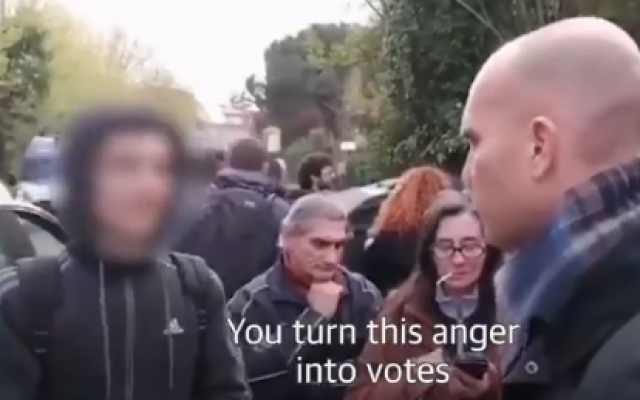 A clip of an Italian teenager confronting far-right protesters has gone viral, after the boy told them he was “not okay” with the way they singled out minorities. The Rome suburb of Torre Maura was shaken by violence and unrest Tuesday when authorities brought a group of 70 Roma, 30 of them children, to a municipal center in the neighborhood. The group was to be temporarily housed there until a permanent home was found for them. But angry residents were soon joined by neo-fascists and others in street demonstrations against the move, saying they did not want an “invasion” of their neighborhood. Roma people, who make up less than 1 percent of Italy’s population, are often blamed for crime. Protesters lit up trash cans and cars, shouted threats and stamped on food intended for the group. A 15-year-old identified as Simone was filmed confronting one of the activists. “I am sure you are an intelligent person, but what you are doing here… is exploiting the anger of the people of Torre Maura, my neighborhood. You turn this anger into votes for your interests,” he said, in a translated clip provided by The Guardian. He agreed that the area suffered from government neglect but said “the 70 Roma have become the pretext to protest. Roma people are not a problem for me… I don’t like the fact that you always pick on the minorities. This young man handled himself perfectly and explained the situation even better. The video was picked up by news media and went viral on social media. The local government eventually appeared to relent to the protests and moved the Roma group once more to a different location.